Sixteen years ago, when I was diagnosed with multiple sclerosis, my doctor told me I'd be in a wheelchair in four years and dead by 56. Each and every day, for the past 16 years, I've faced intractable neuropathic pain that never goes away. Sometimes, it's hard to put on a brave face. To this day, it's the only therapy that works for me, and science has now proven why. My story pales in comparison to those of many I've met across the country. These silent sufferers don't have a platform to share their struggles, and often, lack access or can't afford the necessary care. This year, the Pennsylvania Senate passed excellent, comprehensive medical marijuana legislation in the form of legislation sponsored by state Sen. Mike Folmer, R-Lebanon. The bill has bipartisan support and passed the Senate on a 40-7 vote. The bill cleared a House committee last week and now awaits a vote by the full chamber. It could come as soon as this week. And that's good news. That's because if it's put to a vote, the bill would pass. And Gov. Tom Wolf has promised to sign it—meaning all that separates seriously ill and suffering Pennsylvanians from access to a critical treatment is political maneuvering. Efforts like this get mired in politics all too often. They get stifled by fear mongers, who have ulterior motives, sometimes acting on behalf of donors with a big financial stake in the result. I often hear the argument, "medical marijuana leads more kids using drugs." 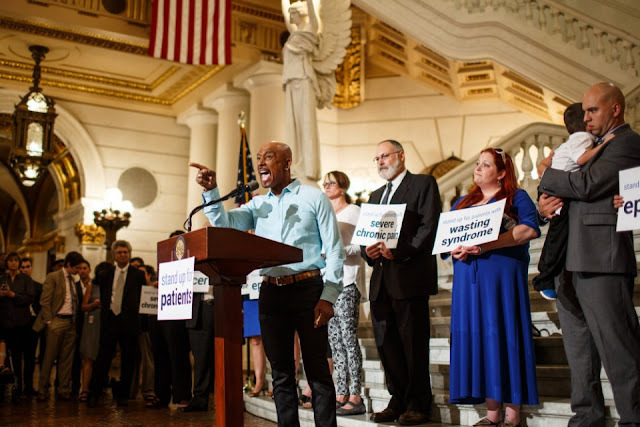 My critique might sound harsh, but so is leaving seriously ill Pennsylvanians without treatment, which is exactly what will happen if the Folmer bill continues to languish in the political doldrums. In a recent Quinnipiac poll of Pennsylvania voters, 88 percent of respondents expressed support for making this option available to patients whose physicians determine could benefit. With 88 percent of Pennsylvanians in favor, why is this bill being held up? Don't the 88 percent of Pennsylvanians, including chronically ill patients who might benefit, deserve an up or down vote from the Pennsylvania House? The House faces a simple choice, politically and morally. Will it stand with an overwhelming majority of voters and its sick and suffering constituents? Or will it allow a few of members to sidestep the democratic process and hold up a vote? I hope Pennsylvania voters will stand up and voice their support. I encourage you to urge elected officials to bring the Folmer bill to a vote in the House.